Why risky, you ask? Because they are heelless, and I, entirely lacking in grace, coordination, and balance, would fall flat upon my face. Clearly they aren't the greatest choice for trotting down the Yellow Brick Road. 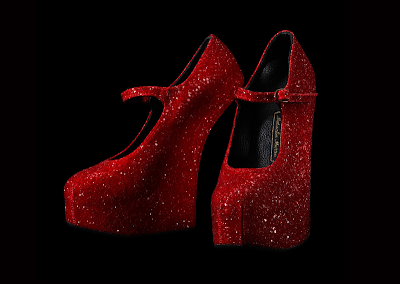 Naturally, that doesn't mean I don't want these sparkly beauties. This is one of those cases where the prohibitively expensive price tag (only 10 pairs are being made at £500 apiece) is actually working out in my favor by preventing me from buying a pair of shoes that I do. not. need. And would injure myself while wearing, no doubt. Lest you think I'm exaggerating, I should perhaps mention my extreme proclivity for ruby slippers. At present I own three pairs, one of which features a major platform heel. I haven't fallen in them, but I also can't really walk in them either. And there's actually still a bit of dried blood on one from where I scraped the opposite ankle against the chunky glitter. I don't think I've worn them out of the house since...2002? Yet they have moved with me to California, back to New York, and now to England. Sometimes I can't help myself. Found via Cakehead Loves Evil, a blog that I don't entirely understand, but enjoy nonetheless.